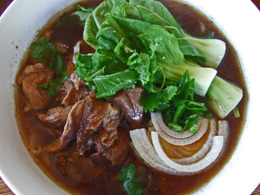 The Lamb Noodle Soup Experiment - Yang Rou Mein - mmm-yoso!!! It's not so much a recipe; I'm only going to list ingredients, and how I prepared the soup. I started trying to measure stuff out, but I had to make adjustments along the way. Overall, I think it was a good test to see if I could actually "cook". So I hope you don't mind this type of post. I bought 3 good sized lamb shanks from Siesel's. I've found them to be pretty large, and have good gaminess. I also purchased 4 pounds of lamb bones. I decided to make both a stock out of the bones, as well as braise the shanks. I'd strain and mix the liquid from the braise with the lamb stock. Mostly because I needed a good amount of broth...since I knew I'd have a good quantity of meat. I'm sure you can make this in one pot, but I enjoy the texture of slow cooking shanks in the oven. 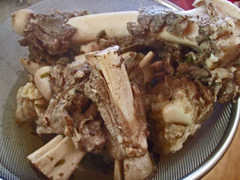 In addition, the bones need to be simmered for a good long time. Because of the amount of fat, I made this a 2 day project. I skimmed off the fat on the second day before reheating. Plus, it always tastes better the next day, doesn't it? - Cover lamb bones with cold water and add green onions, ginger, garlic, star anise, five spice, sichuan peppercorns, ground chilies, and cilantro stems. - Bring mixture to a light simmer(do not bring to a hard boil), reduce heat to keep at a low boil. - Simmer for 3-4 hours. - Once the stock is ready, strain the broth. - Pour back into the pot, add dark and light soy sauce, salt and pepper. Taste and adjust seasoning as necessary. - Heat a Dutch Oven or similar pan (I used an old wok) over high heat, and sear the lamb shanks. 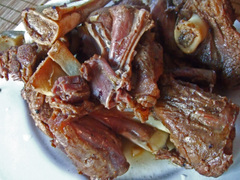 - Once lamb shanks are nicely browned, remove the shanks a place on a large plate. Pour off excess oil, leaving just about 1-2Tb of oil in the pan. - Add Green Onions, Garlic, and Ground Chili. Stir and cook for about 1-2 minutes. - Add Shaoxing wine and deglaze the pan, making sure to remove all the nice brown bits from the bottom and sides. - Add water. There should be enough liquid to cover all but about an inch to an inch and a half of the lamb shanks. Bring liquid to a boil, add soy sauces, five spice, and star anise. - Place lamb shanks back into pot, and cover well. Place in the oven for about 2 hours. 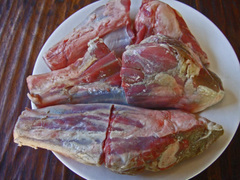 - Once Lamb shanks reach desired tenderness, remove the shanks from the stewing liquid. 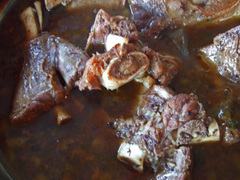 - Remove meat from bones (this should be really easy if the meat is soft and tender). Place bones back into broth. Place meat into a container along with 1-2 cups of broth. This will keep meat moist, and prevent drying out. Leaving the meat separate makes it much easier to portion out, and the meat will not break up as much. - Once the broth is cool, place in the refrigerator overnight. Before reheating broth for serving, skim off as much fat as desired. I heat the meat in the microwave, but you can do whatever you want. I used some store bought Shanghai style noodles that I think is pretty decent. In the North, where the Missus is from, they like their noodles a bit al dente, with a doughy chew. Garnish with whatever you wish. I used thinly sliced onion, green onion, cilantro leaves, and because this was for me, baby bok choy(the Missus hates Bok Choy in soup). The soup was rich and hearty, and the Missus ended up taking my bowl away and started eating it all up. You can even make a hot pot with Napa Cabbage, Tofu, and bean thread. This little experiment turned out pretty good. I hope you enjoyed it. Shoot, that is what you call "winging it," but I call that an innovative culinary masterpiece! Great idea Kirk! sounds like a lot of work but worth it because it looks delicious!! way to go! Just the sound and the thought of "gaminess" makes my mouth water. I wonder how gaminess the broth can be and boy does it look to be very hard work. Almost as hard work as making pho. I forgot to ask did you pre-cook the bones to clean it? I guess it doesn't matter since the broth is dark. Pho beef bones require pre-cooking the bones, what a pain in the arse. It looks pretty good from here too! 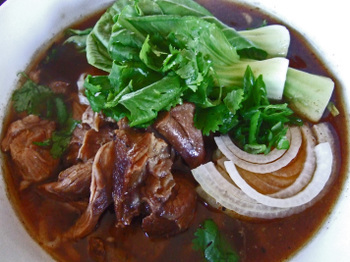 It has the deep rich colour of a beef noodle soup and I love the different spicing (cumin) that you put. Great stuff! I am impressed. Sounds and looks good. Definitely a 2 day job, but the results look worth it. Really nice recipe, reinforcing & deepening the lamb flavor. Rare to see a chef take such actually easy but time-consuming steps at home. Where did you get sichuan peppercorns btw? Hi PE - Thanks! 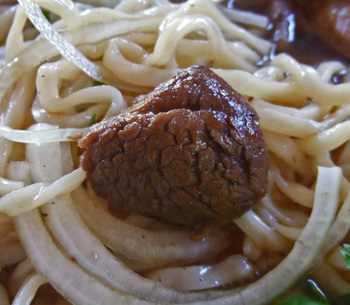 It's really only Niu Rou Mein, but made with lamb. Hi Kat - Actually, this was really easy....mostly just letting everything braise and simmer. Hi Lynnea - Sounds like a lot...but it really isn't much work...very little chopping or slicing...mostly just waiting around. Hi Billy - The flavor transferred very well. It really didn't seem like a whole lot of work to me. I just rinsed the bones, since I didn't need to worry about the clarity of the broth....we wanted it dark and rich looking with a good bit of oil. Hi JS - Yes, the cumin.....one of my favorite Chinese dishes is cumin lamb.....it just seems so right together. Hi Stephen - You know, the actual time spent over the stove and pot was minimal....but the waiting was hell! Hi Trent - I just really wanted a nice rich soup...and it turned out rather well. Hi Hao - Sichuan Peppercorns...99 Ranch Market, spice and seasonings aisle, midway down, North side, bottom shelf...they now have 3 different "brands". I'veheard of another source of top-notch Sichuan Peppercorns, but need to check them out. Great post! I'll have to remember your broth recipe the next time I make hot pot. Ah yes. Anything involving simmering bones to get all the flavor-magic out of 'em is pure food luv in my book. And of course by now you know how I feel about lamb. Bravo! Hi Mizducky - Yep, I do know how much you love lamb....believe me, I do! sooo when are you opening the mmm-yoso restaurant? And are you planning a branch in Sydney perhaps? Hi Rachel - LOL! It's just noodle soup....but are you moving to Sydney perhaps? Cool. I did the same thing with the bones the last time I made Niu Rou Mein. It really helps with the flavor. I'll have to try this some time! Hey Jan - Yes, the bones have all that great flavor.....not to mention the marrow! Wow, I can only imagine what your place smelt like. lol I make pho at home all the time and it makes the whole house smell delicious! You can even smell it outside our front door, for some reason. Hahaa! I really have to try this. I've always wanted tender, juicy, melt-in-your-mouth pieces of meat. Thanks for the inspiration!